When my neighbor and stylist-to-the stars Eric Stern posted on Facebook this morning that he was decked out, head-to-toe, in vintage Hermes, I had to run over and snag a photo of him against the backdrop of gritty Main Street. Nothing says quirky Rosendale contradiction quite like that – although, Eric tells me there exists somewhere a photo of him riding Bill Brooks’ tractor in his fur coat. I’ve got to get a hold of that. And, mind you, it was casual Hermes – madras pants from ’73 paired with a simple white tee. He accessorized with the only pair of orange Hermes boat shoes ever made, and an orange Birkin bag to match. 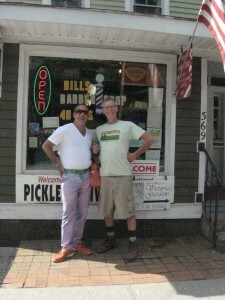 Of course, when I arrived, Bill Brooks was there, too, in his Rosendale Pickle Festival tee shirt. Another perfect contradiction. Bill, a local contractor, is also a barber. For more than 40 years, he’s owned and run what has come to be known as “Bill Brooks’ Shop,” a barber shop that also sells everything from Rosendale Cement bags and tee shirts, to books on local history and packs of Wrigley’s gum. “Bill Brooks’ Shop” is situated just in front of the apartment/office building he put up a couple of years ago, where Eric and his partner David live. Eric, a recent transplant from Chelsea, no doubt wins the most fashionable contest on Main Street. But some of the longtime locals ain’t too shabby neither. 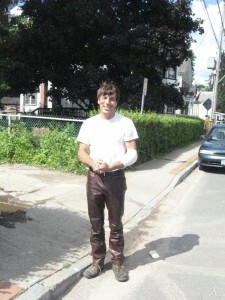 To wit, here’s Russell Muccia rocking leather pants. At 9 in the morning.